SCVHistory.com LW3193 | Film-Arts | Harry Carey Sr., Winifred Westover Star in 'Marked Men' (Universal 1919). 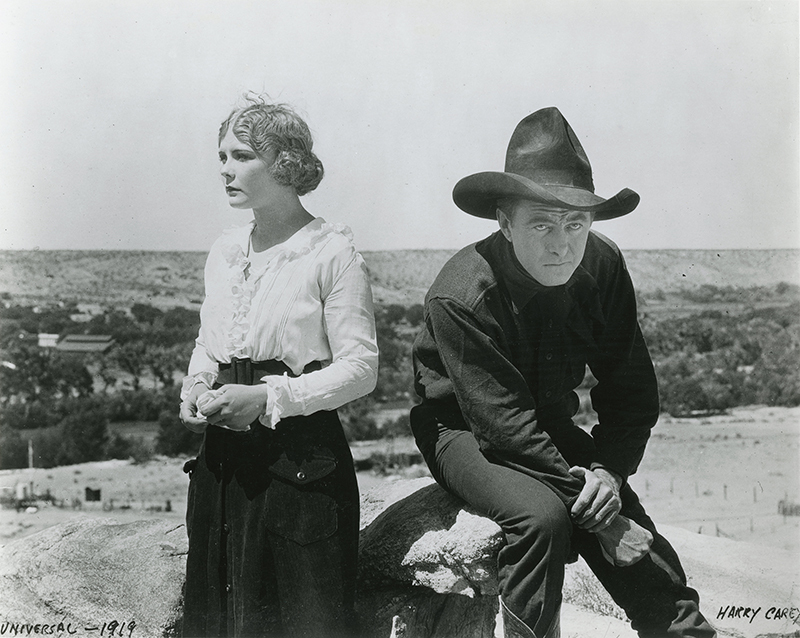 Saugus rancher Harry Carey Sr. (right) returns as "Cheyenne Harry" opposite Winifred Westover (left) — the future Mrs. William S. Hart — in the 1919 John Ford Western, "Marked Men." 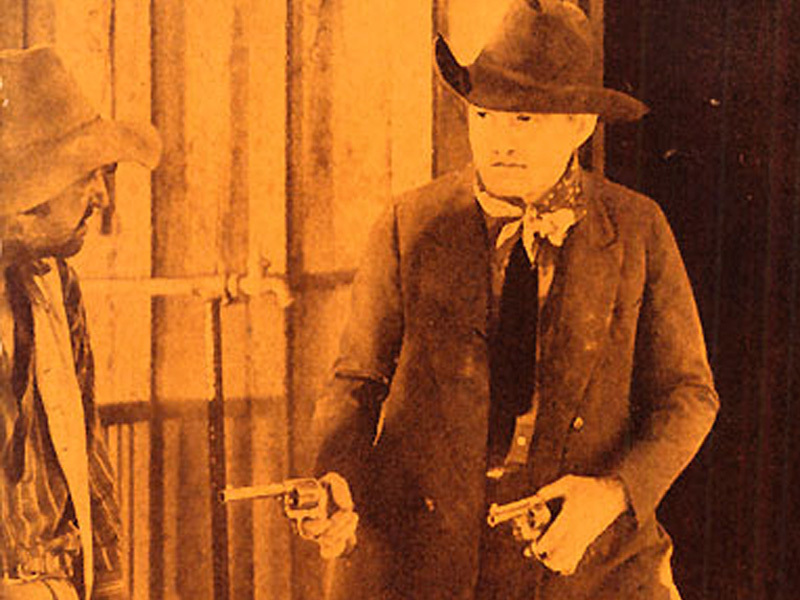 "Cheyenne Harry" was a role Carey played a few times for Ford, including two years earlier in "Straight Shooting," which used Beale's Cut and the Oak of the Golden Dream as locations. "Marked Men" was Westover's next vehicle following "John Petticoats," a Lambert Hillyer picture in which she played opposite Hart. "John Petticoats" was released November 2, 1919; "Marked Men" followed on December 21, 1919. Westover and Hart wed two years later. "Marked Men" is a lost film, as are many pictures from the silent era, so we don't know much about it. Back in the day, the studios weren't particularly good about getting their film prints back from movie theaters, and even when they did, occasionally the nitrate film would degrade and explode and take the studio's entire film vault with it. It might seem odd that that a picture by one of Hollywood's most famous directors, featuring a big star like Harry Carey, would be lost, but it's not the only one. Another John Ford picture with an actor who would become an even bigger star, Tom Mix, is gone, as well. All that's left of "Three Jumps Ahead" are some still images of Mix jumping over Beale's Cut — or not. It was a favorite Ford location. He used it at least four times (counting the insert in 1939's "Stagecoach" with John Wayne), maybe more; with lost films, we'll never really know how many times he used it. "Marked Men" was written by Peter B. Kyne (story) and H. Tipton Steck (screenplay). Kyne also wrote "3 Godfathers," which Ford turned into a motion picture in 1948 starring Carey's son, Harry Carey Jr., together with John Wayne and Pedro Armendariz. Also appearing in "Marked Men" are J. Farrell MacDonald, Joe Harris, Ted Brooks, Charles Le Moyne and David Kirby (uncredited). The producer is Pat A. Powers; cinematography by John W. Brown; edited by Frank Atkinson and Frank Lawrence. 50 minutes (5 reels). LW3193: 9600 dpi jpeg from 8x10 copy print purchased 2018 by Leon Worden.